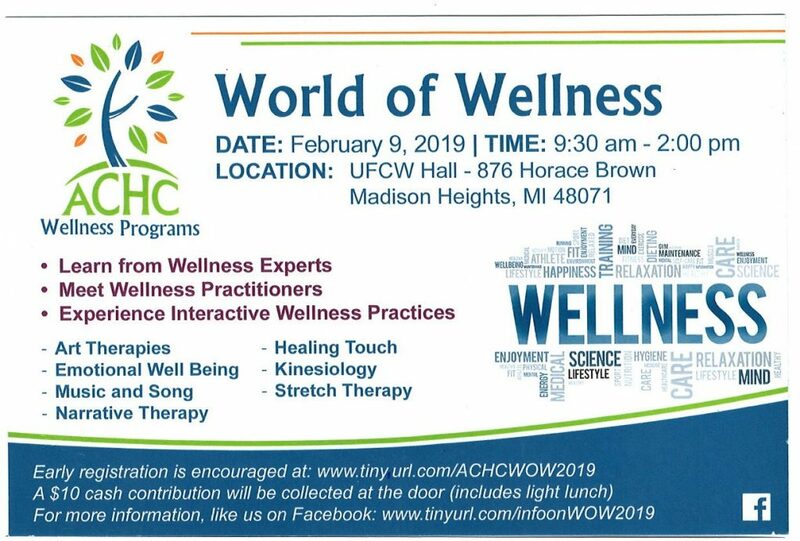 The Alliance of Coalitions for Healthy Communities World of Wellness (WOW) Symposium is an event open for any one that wants to take control and support their mental, emotional and physical health. Based on a TED talk format, wellness experts will begin their 25 minute presentation with a brief explanation of a complimentary, natural healing practice followed by demonstrating and leading the attendees in an interactive experience. The goal of our annual event is to equip the audience with take-home lifestyle wellness skills they can do on their own. Register today and please share this with your friends, families and networks. If you wish to have hard copies sent to you for distribution please contact Diane Dovico at ddovico@achcmi.org or call (248) 221-7101. You can also link to our Facebook event. Any help with publicity is appreciated. We are available to do short presentations for small groups, businesses, etc. or send off a short description for your social networks. Last year's program was a huge success with 100% of our attendees stating they liked the format of short informational presentations followed by practice sessions.